We operate three mobile service vans only until May 2018 but also have a workshop you can bring your vehicle to visit. We cover much of Kent and S.E London complete with specialised test and recharge equipment, pipe and hose repair tools and many spare parts. Each of our three technicians holds the necessary qualification as required by European Legislation as from July 2010 and is an approved Certified Air Conditioning Technician with City and Guilds Certification. Winter a/c service prices from £40+vat but from April 2018 due to EU legislation and hence refrigerant prices this price must increase dramatically to £60 including vat. As a small company we are able to give a very conscientious and personal service in this specialized arena of mobile a/c whether it be for a car, truck, coach, limo, agricultural vehicle or plant machine. The air conditioning system in cars and trucks needs regular attention to keep it in peak condition. At approximately 2-3 year intervals, the refrigerant should be completely emptied, subject to a period of deep vacuum and then recharged to maintain AC efficiency and to prevent potentially expensive breakdowns. Maintenance ought not to be left until the AC is scarcely working before it is serviced as this practice risks component failure and thus expense. The old expression is of course "A Stitch in Time saves Nine". Most vehicles require the cabin (pollen) filter to be changed at yearly intervals and is often missed presuming it is not an important item to service. This can drastically reduce the efficiency of the cooling, heating and demisting in the vehicle and can often lead to some nasty smells in the car. Please mention when booking if you require a cabin filter, usually around £20 including fitting for the best type we can buy. Notice particularly whether the demist control is actually clearing moisture from windscreen and other glassware in the car interior - not everyone realises that this very important safety feature is operated by the air conditioning system switching on automatically when the demist control is selected. If this is not working effectively the driver may have difficulty seeing through the windscreen and thus might depend the life of any of the car occupants, pedestrian, or rider nearby. If you do not have a separate demist button then use both full heat and the AC control together directing the air to the windscreen - the mist should disappear almost like magic. 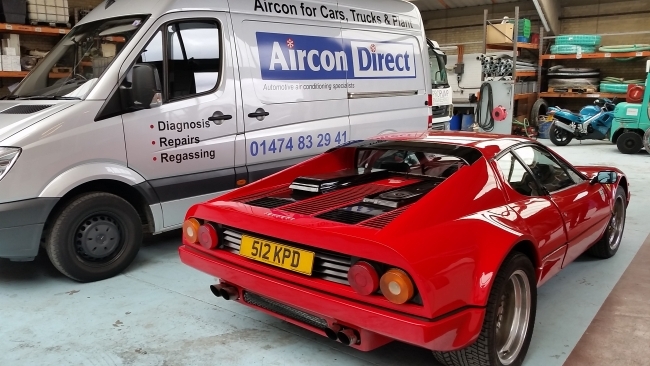 Try http://www.ac4cars.co.uk/demisting.html for full details and also some surprising AC history. Systems where some of the refrigerant is still present may still appear to cool adequately in springtime but once the summer temperatures arrive and put the AC system under pressure to work then without a decent refrigerant charge it will fail to cool sufficiently. During the winter we reduce our prices to encourage owners not to neglect the AC in their car and for those that are able to drive to our workshop we offer a thorough AC service for scarcely more than you would have to pay to have a tyre and exhaust fitter to fiddle with your car's aircon and yet this would be by experienced vehicle AC specialists. This winter time offer lasts until the 30th April 2018 and costs £50 + vat. Payment may be made by cheque, in cash or by most Debit or Credit cards. Please be aware that we always perform a thorough leak check using state-of-the-art electronic leak detectors backed up with a very high quality fluorescent dye to ensure that any leaks can be detected. We do not use the inefficient vacuum-hold facility to try to detect leaks. Nor do we charge any extra for these thorough leak checks, as we consider these all part and parcel of a correct AC service by competent AC professionals. For really troublesome leaks that are difficult to pinpoint we have a very high-tech system that utilises the gas with the tiniest molecule in the universe - if that cannot escape then nothing can. We are a family company consisting of three family members and one long term trusted employee, however Jenny and John are taking a backseat (basically due to the passing of years) so Mark now has full control. Jenny and John may sometimes be heard on the phone if the main phone number is busy. Derek has worked with us for more than 23 years and we have full confidence in his work as an accomplished AC technician. Derek is particularly good at the repair of any leaking pipework and frequently can find an innovative solution to a testing problem. Jenny may well be your first contact with us and also possibly the last if you decide to pay by card. She answers the phones and takes bookings, enquiries and card payments with endless patience and courtesy. Mark, our son, is well steeped in the business, as befits a family member and has a wide experience for such a young man in his mid-thirties. Mark tends to be our electronic diagnostic specialist - in addition to all the specialist AC tools, his van contains a good electronic diagnosis machine and also a multi-channel oscilloscope. He is also now the boss. John, that's me, - I'm the old one.